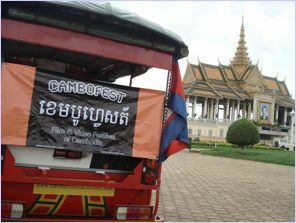 CAMBOFEST: Film and Video Festival of Cambodia was established in 2007 (2550 Buddhist calendar), and is the first international movie festival in Cambodia. Upon its launch, the event became the first regular international movie event to take place in Cambodia since the Khmer Rouge era. The festival has since paved the way for numerous other Cambodian and Cambodia-themed film festival events which followed. Unlike many other cinema events in Cambodia which are funded by international government or NGO organizations, CamboFest is a truly independent festival undertaking. The festival is intended to be a primarily entertaining independent platform for showcasing international and local film and video makers in order to help revive a bona fide cinema industry and movie culture in Cambodia. CamboFest is a private sector, grass roots undertaking. The festival receives no funding from the Cambodian government and continues to welcome in-kind and financial support from a variety of individual and institutional contributors around the world. 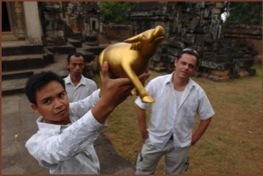 CamboFest Cambodia film festival staffer Phun Sokunthearith holds the Grabay Meas (Golden Waterbuffalo) award, while CamboFest founder and filmmaker Jason Rosette and staffer Narith Hoo look on. As a grass-roots, private sector social enterprise, we build capacity in Cambodian staff without a mandate to do so. Lacking a fully developed cinema culture, local Cambodian CamboFest staff and associates are trained from scratch and often hail from underprivileged backgrounds. Anyone who is eager to take part can do so; and our Cambodian colleagues are paid an above-average wage as they participate in the production of almost every aspect of the event – from purchasing raw materials to screening movie submissions. Another key aim of CamboFest is to promote an awareness of IP (Intellectual Property) practices in the Cambodian media and motion picture sector by securing public performance permissions for every movie we screen from copyright holders. In Cambodia, piracy in exhibition has for some time been the norm, though this is slowly changing with changes in the international TRIPS agreement. However, even today, neighborhood ‘community” cinemas and foreign government-supported art and media venues continue to abuse filmmakers’ copyrights by screening movies without seeking or securing filmmaker or copyright holders’ permissions. CamboFest’s IP diligence has been a notable and verifiable exception, though this position has attracted significant interference from IP-abusing movie pirates in the Cambodian motion picture sector. 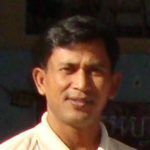 One reason we secure exhibition permissions is because it’s the right thing to do; another reason is that we receive a great deal of contact from foreign filmmakers who would like to participate in a Cambodian-based movie festival, yet they express concern about misuse of their content. It is CamboFest’s position that the only way to operate a legitimate motion picture event, one which can ultimately benefit Cambodia’s development, is to set an example by adhering to normal industry IP practices. We seek and receive permission from all participating filmmakers/copyright holders, and we securely archive (or destroy, per request) all submitted films without producing unauthorized duplicates. Despite the challenges, CamboFest has emerged as one of the most innovative and internationally recognized movie events in the Asian region. To date, over 250 filmmakers from around the world have participated in CamboFest – please consider taking part in our next event as a filmmaker, lecturer, volunteer, supporter, or guest. PHUN SOKUNTHEARITH – Rith, aka Mr. Tol, has been associated with CamboFest since 2008. In 2010, Rith was invited to participate at the DW Akademie Deutsche Welle film festival training program at the Berlin Film Festival and Market. Rith has contributed significant story elements while assuming the role of coordinator and organizer on the CamboFest effort. RAN LUN – Ran has been associated with CamboFest since 2007, and has served in numerous roles including: announcer/host, mechanical operator, venue coordinator, and more. Hailing from the true of the Cambodian countryside, she has been affiliated with other Camerado project as well, including ‘Freedom Deal‘ and others. JASON ROSETTE – Jason Rosette is the founder of CamboFest, while also filling in as venue coordinator, messenger, and many other roles. 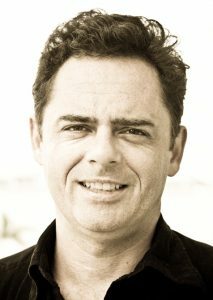 He has made numerous films and videos in the ASEAN-APAC region, while spending the bulk of his time in Cambodia. He has an M.A. 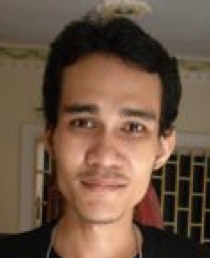 in Development Studies from the Royal University of Phnom Penh. NARITH HOO – Narith assists with the CamboFest effort in the pulicity/outreach departments as well as crafts and construction. He was instrumental in assembling the custom made screen used in the historical 3rd edition of CamboFest, which saw the recovery and revival of the ‘Royal’ vintage movie hall in Kampot, Cambodia.